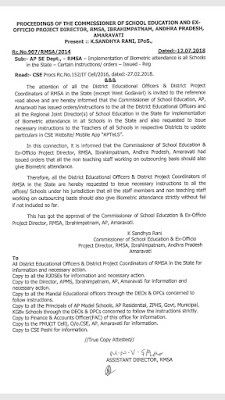 Sub: AP SE Dept., - RMSA – Implementation of Biometric attendance is all schools in the State – Certain instructions / orders – Issued – Reg. Read : CSE Procs Rc.No.152/IT Cell/2016, dated:-27.02.2018. 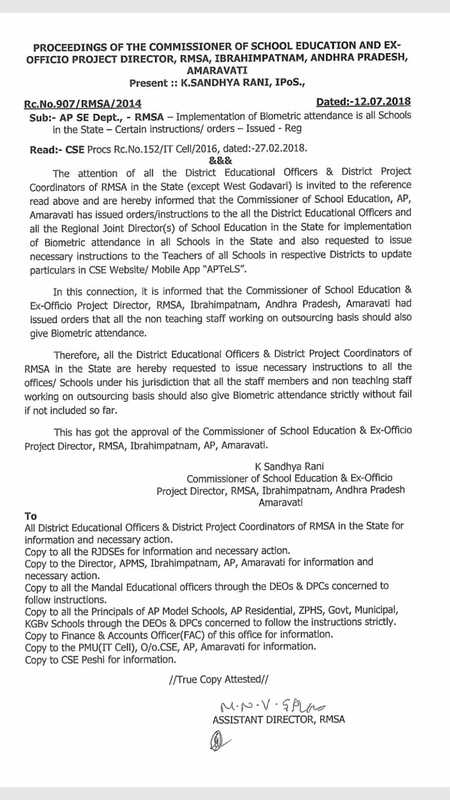 The attention of all the District Educational Officers & District Project Co-ordinators of RMSA in the State (except West Godavari) is invited to the reference read above and are hereby informed that the Commissioner of School Education, AP, Amaravati has issued order/instructions to the all the District Educational Officers and all the Regional Joint Director(s) of School Education in the State for implementation of biometric attendance in all schools in the state and also requested districts to update particulars in CSE Website / Mobile App “APTeLS”. In this connection, it is informed that the Commissioner of School Education & Ex-Officio Project Director, RMSA, Ibrahimpatnam, Andhra Pradesh, Amaravati had issued orders that all the non teaching staff working on outsourcing basis should also give biometric attendance. Therefore, all the District Educational Officers & District Project Coordinators of RMSA in the State are hereby requested to issue necessary instructions to all the offices/schools under his jurisdiction that all the staff members and non teaching staff working on outsourcing basis should also give biometric attendance strictly without fail if not included so far. This has got the approval of the Commissioner of School Education & Ex-Officio Project Director, RMSA, Ibrahimpatnam, AP, Amaravati. andhrapti.com was launched and run by Mr. J.Srinivasa Rao is a Part Time Instructor (Art Education) and very interested person to blogging, sharing technical information and general information with simple way. Welcome to andhrapti.com. Here you can find latest news about department of school education. And also we provide up to date government information, G.O's, Proceedings and other educational information.